So many things to do ... we still have about 1 month before we move to the new house. New kitchen set finished already and we will be waiting for more furniture to be set up around the second week of May. Meanwhile, my husband and I have been visiting the new house a lot; especially my husband to check the progress. Our front and back gardens are still empty, don't have any ideas yet what to put. Grass will go first and then others I think. I couldn't get online much yesterday but I tried my best to reply all the comments and checked on everybody's wonderful posts. Hi Lia, sounds like your move is "moving along". :) A lot of work but isn't it a little bit of fun too? i like all ur post very much!! it's so cute!!! simply lovely bento! I love those picks. Must get my hands on them! Hi its me, Jasmine. Love your post and bento ideas..good job!! Too adorable bug and carrot lions on the fish balls! Rolled bulgogi is a good idea and sounds easy to eat. Wish you and family a great weekend! This is a bento box full of fun. I love the fishballs & carrot flowers! The rice bakk bug is just too cute for words! Good luck on getting readly for your move. Do you have any idea when this is happening? Your lady bug is so cute!!! Another beautiful bento! Really admire you... even amidst your house moving, you're still able to pack beautiful bento! Wishing you and your family a good weekend ahead! The bee is so adorable, I thought you make this to participate 'The Garden' bento contest holds by Debra. @sherimiya : Thanks a lot Sheri! You are always so sweet ... I hope I'm not getting too much stress because of this moving things. I will take some pictures later :) Hope you have a great weekend with your family! @SIG : Thanks a lot! Yes, those picks are cute. You should get some hehehe ... :D Have a nice weekend! @babykins : Thanks a lot Izumi! I rolled the meat for the size of my kids' one mouthful bite so it will be very easy for them to eat. It's about one month left ... I think this will be very quick :) Have a fun weekend with your family! WOW! Lia, this bugs really makes me smile. Love looking at it. What a cute ladybug, have a wonderful weekend. 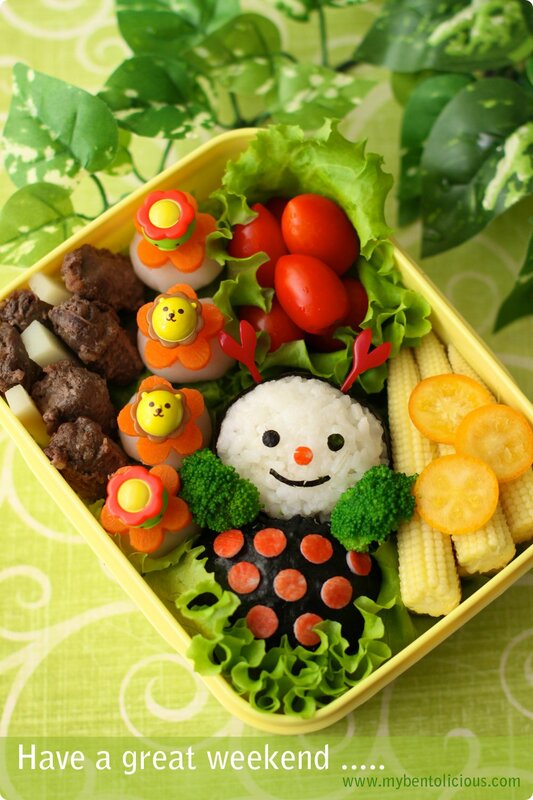 Love this vibrant and sweet bug bento. Happy weekend, maybe the circus will inspire a bento creation? @bentobird : Thanks a lot Jenn! We couldn't get the ticket for tonight but for Sunday afternoon instead. Hope I can get some ideas from the circus later. Thanks to remind me :) Happy weekend too Jenn! happy bug in the cute garden, i love it! hope your move is going smoothly lia, and i know you will think of tons of wonderful things to put in the gardens... can't wait to see how your new home influences your beautiful bentos! have a great weekend! @Kuusou : Thanks a lot Kuusou! Sista, beli alat2 untuk buat bentonya dmana yah?? The bug looks super cute (love the little antlers) and the picks on the carrot flowers are just adorable. @Ceinwyn/Ingrid : Thanks a lot Ingrid!